Deluxe Polish and Shine What's this? Legendary Irish hero Fergus of Ulster, Slayer of Sinach, wielded a fearsome "lightning sword" known as Caladbolg. No one really knows what this sword looked like, but we're betting it was similar to this classy celtic two-hander. 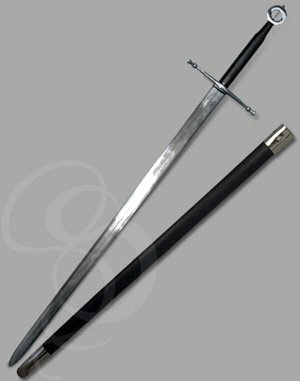 At a towering 52" long, this is a sword that can both intimidate and impress friends and enemies. The most notable feature of this sword (other than the massive 42" blade, that is) is the polished-steel Celtic ring pommel at the base of the grip. The unusual pommel lends a bit of refinement and artistic sensitivity to this fierce looking sword. A portion of the sword's tang passes through this ring, and is visible through the center of the circle. This type of artistry is typical (if a little advanced) for the Celts, who used organic shapes and themes in their craftsmanship. The blade on this monster is a towering 42", which puts it in the Battle-Sword/Holy-Crap-That's-Big category. It's made from Strongblade's polished, high-carbon steel and features a unique triple-fuller design. These three fullers would have given the blade extra strength and a tiny bit less weight. The elongated grip on this Irish two-hander is made from rugged hardwood wrapped with double-stitched leather. The grip tapers slightly near the pommel, where the celtic circle joins it. 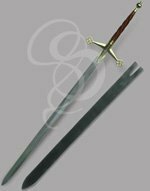 The guards are made of polished steel, and jut straight outward from the grip, with no curve to them, as is common with many swords of this size. Not so common are the organic spheres just inside of the flared tips at the end of the guards. These spheres reinforce the circular celtic theme of the ringed pommel. 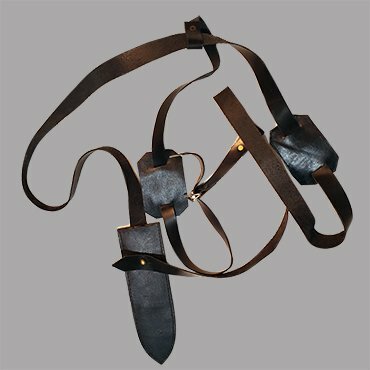 Caladhcholg comes with a steel-accented, custom-fitted sheath of leather-wrapped wood. Huge muscles and battle-rage not included. Strongblade does not recommend trying to slay giant, marauding killer water dragons with this sword. Now available without any fullers on the blade! The traditional sword is offered with fullers(grooves) running down the blade. Although the fullers provide an accent to the blade, they do limit the engraving space on the blade. We can engrave between the fullers, but the space is limited. We now we offer an exact version of this sword but without the fullers. The blade is an open canvas waiting for any engraving design you choose. Even if you prefer not to engrave the blade, the bare blade may appeal to those who like the look of a simpler blade design. This sword includes a leather wrapped wooden sheath, but we also offer an optional back hanger. The back hanger allows you to wear the sword on your back "Braveheart" style. The included scabbard is not used with the back hanger. Please note: Because of it's size, this item is subject to oversized package shipping rates. This sword is beautiful! Absolutely amazing, and more than I could have hoped for. 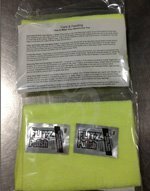 The quality is superb, and it was engraved, mailed out, and received in no time at all. I couldn't be happier with the results! I purchased this as a retirement gift for a friend. The engraving was beautiful and the sword impressive work. Everyone loved it and want one for themselves. I highly recommend Strongblade.